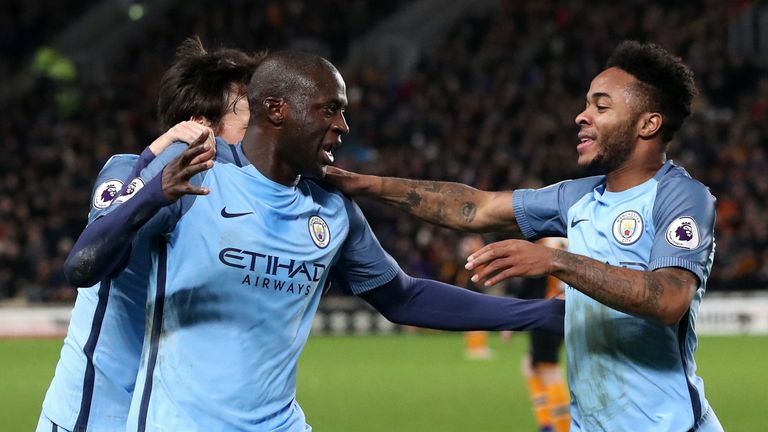 Manchester City have won three consecutive Premier league games for the first time since their run of six from the start of the current season (which ended in September). Hull have won just one of their last 16 top-flight games, drawing three and losing 12. City registered just their second clean sheet in their last 12 top-flight away games. Yaya Toure has scored all 10 of his Premier League penalties, the best 100 per cent record in the competition. Hull have conceded nine penalties in the Premier League this season, four more than any other side (with eight of those converted by the opposition). Only Jamie Vardy (10) has won more penalties in the Premier League since the start of the 2013/14 season than Raheem Sterling (7). Hull have conceded the first goal of a game more times this season than any other Premier League team (15). David Silva (61) has provided more Premier League assists than any other player in the competition since his debut in August 2010. Kelechi Iheanacho has netted 12 Premier League goals from just 19 shots on target. Sam Allardyce has failed to win his first Premier League game in charge with each of his last two clubs (also Sunderland), after winning each of the previous four (Bolton, Newcastle, Blackburn and West Ham). Troy Deeney became the fifth player to score 100 goals in all competitions for Watford after Luther Blissett, Tommy Barnett, Ross Jenkins and Cliff Holton. 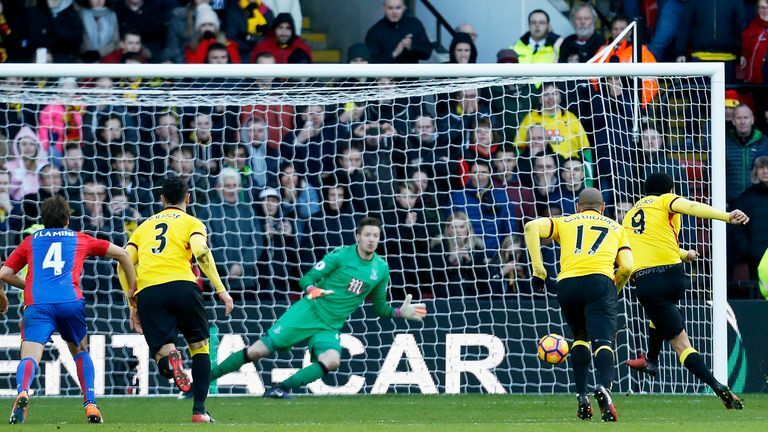 Deeney is now Watford’s all-time leading scorer in Premier League history (17 goals); one ahead of Odion Ighalo (16). Of all Premier League goalkeepers to face 20+ penalties, only David Seaman (32 per cent) has a better save ratio than Heurelho Gomes (30 per cent – saved 9/30). Christian Benteke has missed more penalties this season than any other Premier League player (2). Crystal Palace have failed to keep a clean sheet in 22 of their last 23 Premier League games (3-0 vs Southampton). Today was the fourth time in Premier League history that a club has had two starting players subbed off in the opening 15 minutes. Yohan Cabaye has scored in both of his Premier League appearances at Vicarage Road. 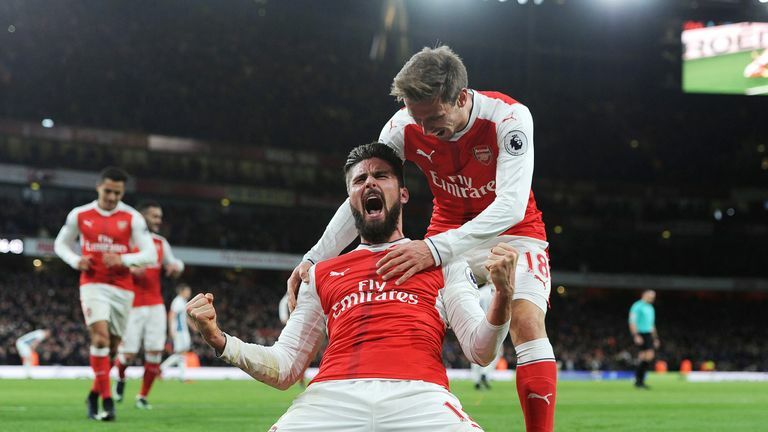 Arsenal have scored in all 21 of their Premier League games against West Bromwich Albion, the best such 100 per cent record in the competition. Tony Pulis has lost all nine of his Premier League visits to the Emirates Stadium as manager, with his sides scoring just three goals in that run. Mesut Ozil made his 100th Premier League appearance, and provided his 36th assist in the competition – only Eric Cantona had provided more after 100 games in the division (39). Olivier Giroud has scored seven goals in his last five starts for Arsenal in all competitions. The Gunners kept their first clean sheet in nine Premier League games, since a goalless draw with Middlesbrough in October. Meanwhile, the Baggies have failed to score in consecutive league games for the first time since September. Arsenal had 23 more shots than West Brom today (26-3), their highest such margin in a Premier League match this season. Indeed, the Gunners’ 26 shots was their highest in a Premier League match since beating Leicester 5-2 in September 2015. Burnley secured their first win in their last seven league games against Middlesbrough (D2 L4). Middlesbrough have enjoyed just one win in their last 22 away Premier League games (D6 L15). 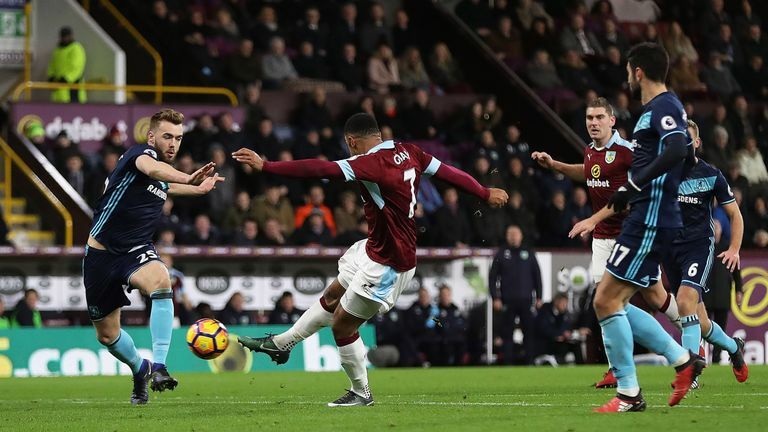 Burnley have found the back of the net in eight of their last nine top-flight games at Turf Moor. Middlesbrough didn’t direct a shot on target until the 60th minute, via Gaston Ramirez. Andre Gray bagged his first goal in his last 10 Premier League appearances. Gray scored with his only shot of the game. Sam Vokes has been directly involved in six Premier League goals this season (four goals, two assists), two more than any other Burnley player. Nineteen of Burnley’s 20 Premier League points this season have been won on home soil. Chelsea have won 12 consecutive league games for the first time in their history. Antonio Conte is the first Premier League manager to win 15 of his first 18 games in the competition. Bournemouth have lost three of their last four Premier League games, conceding three goals in each defeat. 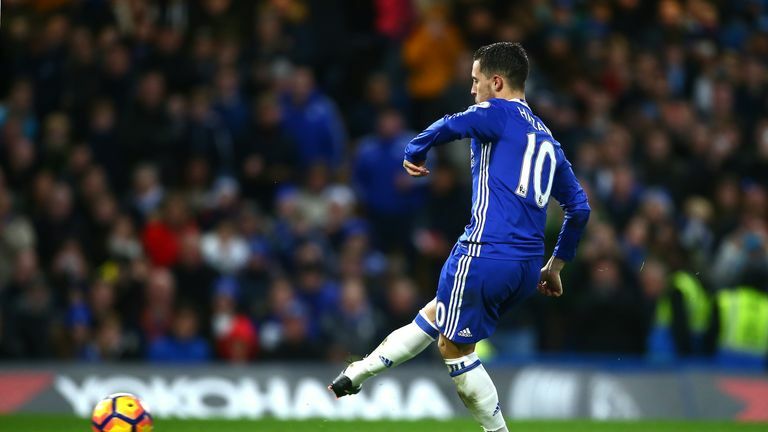 Eden Hazard is the sixth player to score 50 Premier League goals for Chelsea after Frank Lampard, Didier Drogba, Jimmy Floyd Hasselbaink, Gianfranco Zola and Eidur Gudjohnsen. Only Hasselbaink (84), Drogba (106) and Gudjohnsen (153) reached 50 Premier League goals for Chelsea in fewer games than Hazard (155). Cesc Fabregas has provided 98 assists in the Premier League; only Wayne Rooney (101), Frank Lampard (102) and Ryan Giggs (162) have more in the competition’s history. Fabregas has scored or assisted in each of his last three Premier League starts for Chelsea (one goal, two assists). The Foxes haven’t won a Premier League Boxing Day match since beating Sheffield Wednesday 1-0 in 1998 (D1 L6). 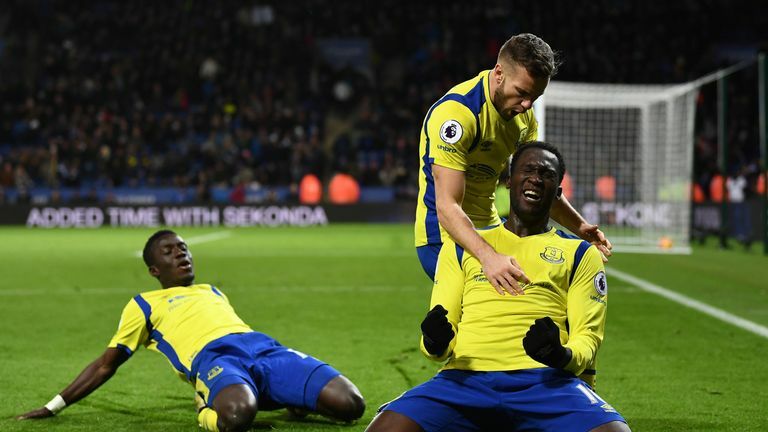 Everton’s 2-0 victory over Leicester ended a run of six Premier League matches on the road without a win for the Toffees. Joel Robles became the 50th different goalkeeper to provide an assist in Premier League history. Everton are unbeaten in their last five Premier League away games on Boxing Day (W3 D2 L0). Romelu Lukaku has scored seven of Everton’s 11 Premier League away goals this season (64 per cent). Lukaku has been directly involved in 13 goals in 17 Premier League games this season (10 goals, three assists). Kevin Mirallas has scored in each of his last three Premier League appearances against Leicester. Everton have lost just two of their last 14 Premier League games against a reigning champion (W7 D5 L2). Zlatan Ibrahimovic has been involved in 14 Premier League goals this season (12 goals, two assists) – at least eight more than any other Manchester United player. Fabio Borini netted his first Premier League goal since May (vs Chelsea). The Red Devils notched up their 19th Premier League Boxing Day win, more than any other side. Jose Mourinho has won four Premier League games in a row for the first time since April 2015 with Chelsea. All three of Paul Pogba’s assists in the Premier League this season have been for Zlatan Ibrahimovic goals. 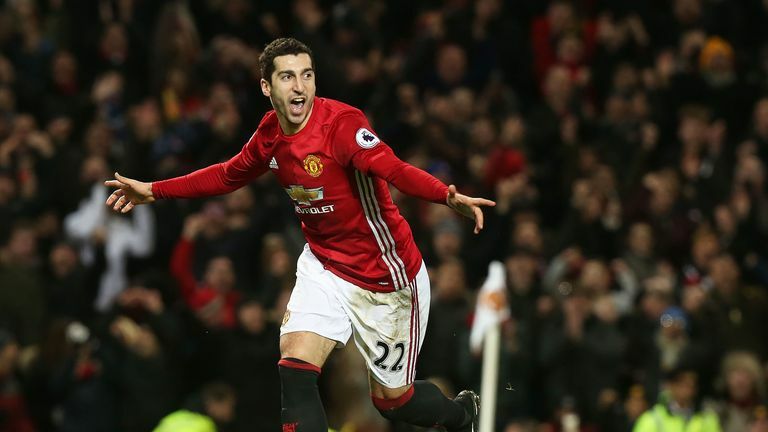 After failing to score in his first 10 games for the Red Devils in all competitions, Henrikh Mkhitaryan has scored in each of his last three. Sunderland have won just one of their last 25 top flight games away to Man Utd (D7 L17). Jose Mourinho’s Premier League win rate at Man Utd is now 50 per cent, the same as David Moyes’ in his tenure at Old Trafford. 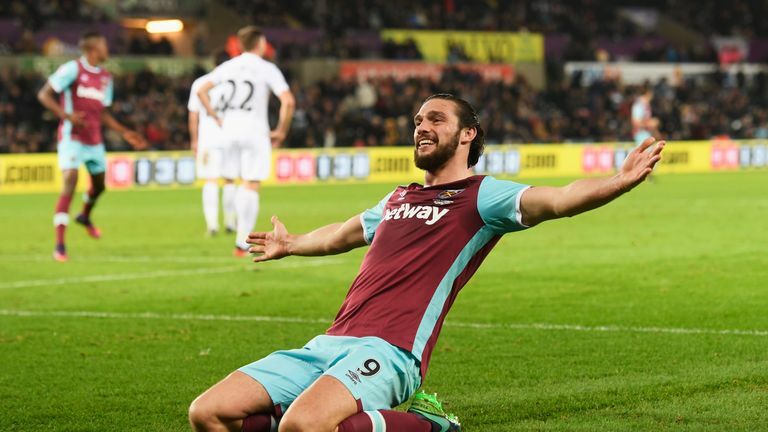 West Ham have won three consecutive Premier League games for the first time since March. Swansea have shipped 29 goals in the top flight since Bob Bradley took charge (Oct 15), more than any other side. Nine of Andre Ayew’s 13 goals in the Premier League have come at Liberty Stadium. Ayew is the 41st player to score both for and against West Ham in the Premier League, more than any other club has seen. Swansea have conceded the first goal in 13 Premier League games this season, only Hull have done so more often. Dimitri Payet has provided 15 Premier League assists in 2016, more than any other player. Michail Antonio has scored 16 Premier League goals for West Ham since the start of last season, five more than any other player. All six of Fernando Llorente’s Premier League goals for Swansea this season have come at Liberty Stadium.